Experience, insight and knowledge gained over multiple financial cycles and across financial disciplines. Ongoing commitment to integrity and full transparency. Dedication to providing unparalleled personal service. Client-centric approach to financial planning and wealth management that places your interests first. Commitment to educating and guiding you through life’s transitions, market shifts and changes in your life, goals or objectives.... helping you to make informed decisions at every turn in your path. 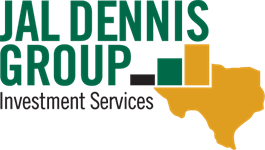 Depend on the Jal Dennis Group to provide the education and answers you seek, keep you focused on the big picture and guide you every step of the way on your financial journey. To maintain our high standard of client care and personalized service, the Jal Dennis Group accepts a limited number of new clients each year on a referral basis. Contact Us to schedule a no-obligation consultation to determine if we are the right fit for your financial planning and investment management needs.